What does it mean to call Mary ‘Spouse of the Holy Spirit? What are the implications for our spiritual lives? 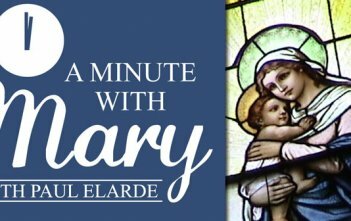 Paul Elarde reflects on the tremendous power of praise in this edition of A Minute with Mary. In your prayer life, how much time do you spend in petition, and how often do you give thanks for what you’ve already received? In this edition of A Minute with Mary, Paul explores two great aspects of prayer that we often neglect: praise and thanksgiving. Paul Elarde reflects on how we need to tap into the Source of Love through prayer. We may think we can live a ‘good Christian life’ merely by doing good works – but if our prayer life is neglected, can we truly follow Christ? Paul Elarde reflects on three pillars of faith that help light the path to salvation: the Eucharist, Mary, and the Pope. Paul Elarde provides a brief background on the brown scapular, its origins and its association with Marian consecration.